Recorded in St Mary’s Church, Wellingborough, 2010. 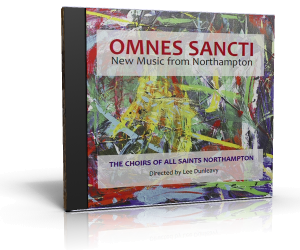 OMNES SANCTI features the Boys, Girls and Men of All Saints performing thirteen works commissioned or written for the choirs. The booklet that accompanies the disc includes comprehensive notes on the works performed and the artists featured, and full texts and translations can be downloaded here. We were delighted to record once again in the wonderful acoustics of St Mary’s Church in Wellingborough, where their Hill Organ (specification) has recently been restored, and a Trombone stop from a former organ at All Saints has been added. The disc concludes with the first recording of the original scoring of Malcolm Archer’s Missa ‘Omnes Sancti’, for choir and two antiphonal organs. During the restoration of the Hill Organ St Mary’s hired a large instrument (specification) from local digital organ builder, Copeman Hart, and we were delighted to unite these two organs for the first time, installing the digital instrument at the West end of the Church. * Richard Pinel (Grand Orgue) with Stephen Meakins (Orgue de Choeur). With the exception of tracks 1 and 18-22, all works receive their first commercial recording on this CD.